Of course, if any innocent bystanders would smirk, Ma would quickly look at us and say, â€œwhat’s your problem?â€ and we would try to hold off falling on the floor from laughing so hard or it would have turned into the other extreme. Then there would be the time my kid brother would visit from out of the country, he in his thirties by then and me in my- never you mind. Gary would stay at Ma during his visit so I would come over and we would be having a glorious dinner and the two of us would start in needling each other until it rose to a crescendo. At that point Ma would shout, â€œstop it you two, or I’m going upstairs!â€ After we waited the necessary five minutes to keep our collective mouths shut, we’d start up again and Ma would say, â€œcan’t you two ever get along?â€ Of course, what she didn’t want to acknowledge was that it was our way of getting along- she just found it annoying. I’ve been told by Ma’s younger brother that when they were kids, she organized a gang of two- them. They would go around beating up other kids who refused to play ball with them. Literally- I mean, she would beat them up if they wouldn’t let her play in the ball game already going on. 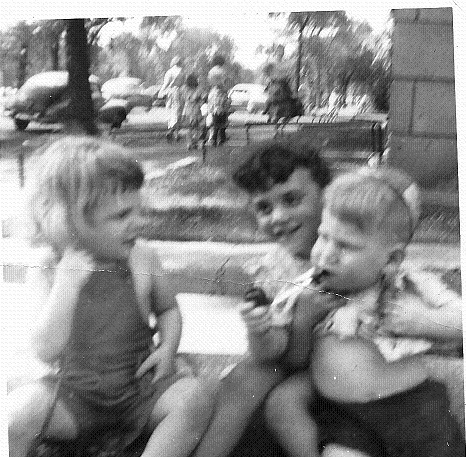 In the late 1950’s, when it was just my older sister, a younger one and myself hanging around the house, if one of us got on Ma’s bad side, she would vent her anger. If one of us stood behind her laughing at the sibling taking the brunt of her wrath, she would quickly turn around and say, â€œyou want a piece of this, too?â€ And this from a lady who tells me when I chauffeur her around now that I need to to take anger management. A couple of years ago, I invited to her house a family who lives near me to expand on her friendships – the father, mother, son and daughter. At the time, the daughter was twelve. We were eating a fancy meal in Ma’s dining room and I was goofing off as usual, so Ma threw me a wicked slider and said for all to clearly hear, â€œstop acting like a baby. Can’t you grow up already?â€ Naturally, since then that twerpy teenage girl throws that line in my face as often as she can. But again, when we used to play one-on-one basketball in her driveway, I never showed mercy and beat her off the dribble too many times. She won’t play ball with me anymore, so who’s the baby now, huh?